Leather production | Infonet Biovision Home. Leather production 1. Course for women learning about leather preparation at KIRDI, Nairobi. Leather production 2. 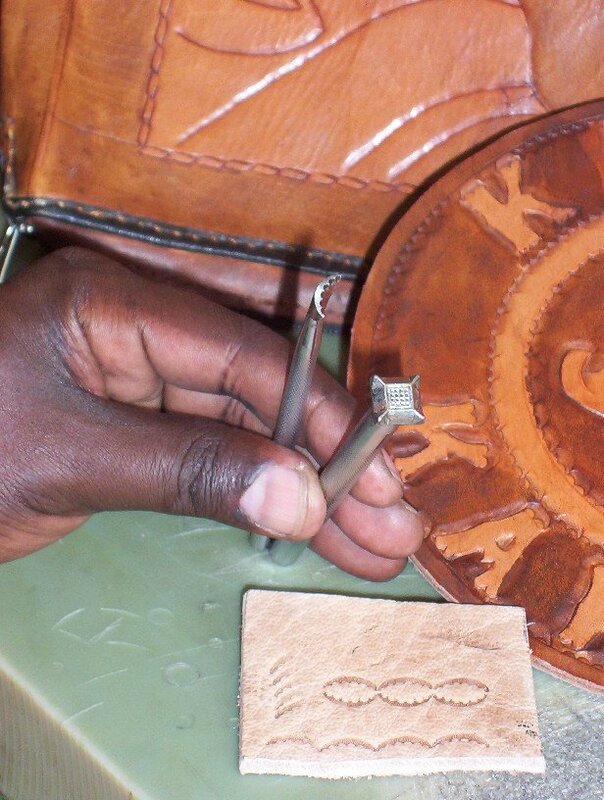 Course for women learning about leather preparation at KIRDI, Nairobi. Leather production 3. 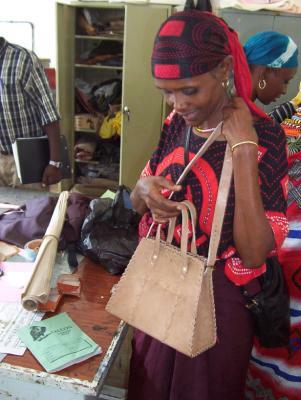 Course for women learning about leather preparation at KIRDI, Nairobi. Leather production 4. Course for women learning about leather preparation at KIRDI, Nairobi. Leather production 5. 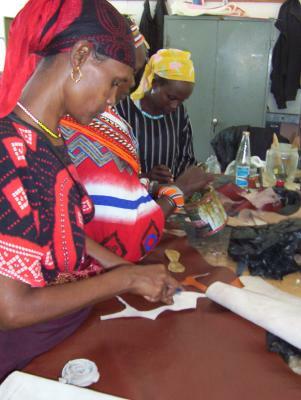 Course for women learning about leather preparation at KIRDI, Nairobi. From 2001-2004, KARI (Kenya Agriculture Research Institute) carried out research on utilization of milk meat, hides and skins in Northern Kenya. The following environmentally friendly recipes are extracts from this research. The most valuable remaining part of the animal after slaughtering is the hide. Traditionally, hides and skins in northern Kenya are dried and since a local market for raw hides and skins hardly exists in the area, only the best hides are traditionally used for simple tanning. The resulting leather is hard and not very durable. Out of hides, skins and leather the women usually make traditional containers, covers for beds or clothing. For the latter, goat and sheep skins are preferred over camel hides. In other pastoral Kenyan societies, notably the Maasai around Kajiado, rural tanning enterprises have created employment and a small, but successful handicraft business supplying mainly the tourist sector has evolved. Using the below recipes it is possible with some practice to produce very good attractive leather in a village or home situation. 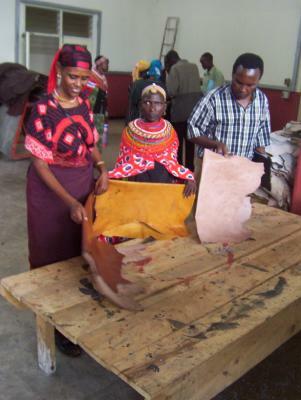 The total annual trade in raw hides and skins from Marsabit district in 2003 was estimated at 23,000 hides and 76,000 skins with a total turnover of USD 97,000. The market price is determined by volume offered, quality and weight of the raw hide / skin. Below table gives some estimates from 2004 of the possible value addition to hides and skins by tanning. The calculations were made in US Dollars (In January 2009: 1 US$= Ksh 77/-). Table 1. Approximate prices and possible value addition of tanned hides and skins (2004). Table 1 shows that a dried unprocessed goat skin which could at the time sell for Ksh 50/- if the size and quality was good, could fetch from Ksh 200/- 400/- when tanned depending on quality and size. Considering the amount of goat skins which are just discarded, tanning skins and hides could become a good income booster where there is plenty of hides and skins available. * The weight of wet/soaked goat/sheepskin was taken to be 4.5 kg whereas that of half a camel hide was estimated at 15 kg in calculating the cost of processing leather. The table shows that the vegetable tanned hides and skins were more expensive to produce, but also fetched a higher market price due to their better quality and appearance of the finished product. Animals in pastoral environments are kept in bomas, which are night enclosures built piling up branches from thorny trees and bushes (such as acacia spp.) in a circle. The thorns cause frequent skin injuries in the animals and therefore unwanted marks on the finished leather which lowers the quality and the market price. The best sales prices for leather are obtained from unmarked undamaged hides and skins. However home tanning is hard work, and takes time. Equipment does not have to be very expensive for small operations, but a small investment is needed. Leather tanning requires plenty clean water of fairly good quality. Water quality: a concentration of calcium carbonate above 400 mg/litre is generally considered too hard for tanning and KIRDI recommended to use soapless detergents or soften the water with commercially available chemicals such as DIASOAK (available at swimming pool supply shops in Nairobi) before using it for leather tanning. The water from Ngurunit and Laisamis had calcium carbonate content of 585 mg/litre or more and pH of 7.7. 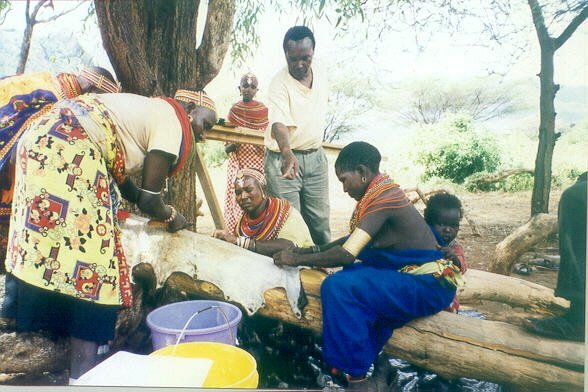 The KALRO experience in Ngurunit and in Laisamis showed that the local water worked well without treatment, despite the fact that it was harder than recommended. It was therefore concluded that the guidelines provided in the literature do not necessarily apply under all conditions. - Fat liquor oil (castor oil based) - 20 litres. All tanning and oiling work needs to be carried out in shaded areas, as leather should not dry directly in the sun, otherwise the fibres contract too quickly and the resulting product is too hard. Any large enough roofed and preferably netted-in area can be used. Netting or walls are needed to protect from dogs and wildlife, but there should be ample light for working. Chemicals and equipment need a lockable store. Camel hides measure between 18 and 25 square feet and weigh up to 35 kg. They are usually too heavy to handle properly if in one piece, and the usual practice is to just divide the hide at butchering time. Also some cow hides are too big to handle in one piece, so they can also be divided for example down the middle. However if at all cow hides can be handled in one piece, they will fetch better prices. Goat and sheep skin are always prepared as one piece. Tanning can be done on either dehaired or non dehaired hides and skins. Some goats for example have very beautiful markings on their skins, which may be worthwhile preserving for special purposes, in which case dehairing is not carried out, and the skin goes straight to tanning with the coat of hair on. Camel hides however are usually not very attractively coloured, and camel leather being strong and quite in demand will need dehairing. To produce leather, the first step in preparing hides/skins for tanning is de-hairing and de-fleshing. Dry hides/skins need to be soaked in clean water for two to three days before de-hairing, wet (fresh) hides/skins can be de-haired directly. The most successful method used was a 4% solution of hydrated lime dissolved in enough water to adequately cover the hide. (calculated on the basis of the hide / skin weight. This means if a hide weighs 20 kg, hydrated lime needed is 4% of 20 kg or 0.8 kg lime) Hydrated lime is easily obtainable in Nairobi and surroundings at a cost of KES 500 per 50 kg (2004 price) The thick parts of camel hides take longer than other parts to release their hair. A recommended addition of 1% Sodium Sulphide (again on the basis of the weight of hides / skins) to speed up the process is possible, but this highly corrosive chemical needs to be used very fast. As time is not usually of importance in many rural areas, its use cannot really be justified in the normal operation of a small rural tannery. Also, this chemical is neither very environmentally friendly nor safe to use in most environments, and hydrated lime does the dehairing perfectly even without it. 30 litres of water with the 4% hydrated lime was enough for 1 camel hide (two halves) or 15 goat/sheep skins.). When the hair slips off by slight pulling, the skins / hides are ready for scraping with blunt utensils on the grain side to remove all remaining hair. De-hairing of a sheepskin took one day of soaking in the solution, cow hides about two days, and camel hides three days. Frequent stirring of at least four or more times a day (the more the better) was necessary to ensure equal exposure of hide or skins to the lime solution. The hides/skins swell with the lime solution being soaked into to pores, and become very thick. It is very important to ensure that all parts of hides/skins are submerged under water/lime solution, as exposure to air with lime coating can cause 'burns' or discoloured patches on the finished leather. After de-hairing remaining parts of flesh that need to be removed stand out very clearly and have to be scraped off. A fleshing beam and fleshing knives were used for this purpose. Suitable beams can made out of old fallen tree trunks and logs. They should be smoothened to form a good firm basis for the fleshing knives, which were manufactured in Nairobi at Ksh 1500 each or made by local artisans according to a drawing by the hides and skins specialist of the government extension service. After all of the hair and remaining flesh is removed, the hides/skins which have swelled to double or triple thickness during dehairing process, must be de-limed by washing in plenty of clean water and submerged in a neutralising solution until it reduces thickness and pH again. In our experiments the best de-liming chemical was 2% ammonium sulphate (a commonly available fertilizer, at about 1300 Ksh per 50 kg bag, percentage again calculated on the basis of the original weight of the hide / skin . Our original 20 kg hide would need 2% of 20 kg or 400 g of ammonium sulphate). However, where this chemical is not available, a solution of 1 litre of vinegar in 10 litres of water can be used, which also produced good results. The skins/hides were submerged in the solution and stirred every couple of hours. Through frequent monitoring the point when the lime-induced swelling disappears completely needed to be established. With small skins, this process will take only a few hours, whereas heavy hides may need to be left in the solution over night. After removal from the de-liming solution the hides / skins need to be washed well in clean water to be ready for the tanning solution. Changing the very alkaline environment of de-hairing into a slightly acidic environment is important as the tanning works best in the latter. Large-scale tanneries work with highly corrosive chemicals such as sulphuric acid, but this is too risky and dangerous under home or village conditions. The vinegar solution worked very well in Ngurunit. An alternative which could be tested - if the above mentioned ingredients are all not available - is based on experiences with rural tanning in Zambia where fermented maize flour was used (Hoyle 1994). Maize flour can easily be found in most places in Africa and it will ferment on its own if put in water. The most commonly used tanning methods for leather in Kenya are chrome based tanning or vegetable tanning (with mimosa or other plant derived extracts). The team also tested alum tanning, as alum is easily available and alum tanning recipes for home tanning are often found in literature. Alum tanning does not change the colouring of hairs, and so would be best suited for skins where it is decided to preserve the hair coat. Hides or skins tanned in the same solution need to be soaked at the same time. When a second hide or skin was added to the tanning solution the following day, it seemed to actually be removing tanning chemicals from the first hide or skin, rendering the process less efficient and resulting in products of less good quality. Ali tanning was described by Hardwick (1996) and the US Department of Agriculture (1962). In this process, the collagen fibres in the skin / hide are coated with a layer of alum molecules. Alum tanning is commonly recommended in the literature for home tanning (Hoyle 1994, Hardwick 1996) as it is an easy, safe and environmentally friendly method of tanning. 250 g of rock aluminium are fully dissolved in 3 litres of hot fresh water. 200 g of table salt are separately dissolved in 4 litres of cold fresh water. The two liquids are slowly mixed while constantly stirring. If the liquids are mixed too quickly, the resulting solution becomes cloudy and is not very effective. The resulting 7 litres of solution are left to cool down to room temperature and then up to 4 small skins are submerged. For one camel hide, the ingredients have to be quadrupled to produce enough liquid for tanning. This method can be used for both non-de-haired hides / skins (for decorative purposes) and for de-haired hides/skins (to produce leather). With non-de-haired hides / skins only de-fleshing needs to precede the tanning. Alum tanning will produce pure white leather, or clean looking skins with the hairs left on. Goat and sheepskins needed three to five days in the tanning solution with frequent stirring (at least four times a day). Large camel hides require up to seven days. To test for full penetration of the solution into the hide/skin, a small cut on the side will show whether the solution has saturated the hide/skin completely. Alternatively, a crease can be made on the edge of the hide/skin and if is does not disappear, tanning is complete. This was the case after two days for a sheepskin, while a camel hide took four days to reach the same stage. After removal from the alum solution, the hides / skins were dried on a clothes line or wire in the shade. While drying, skins were regularly stretched and pulled by hand to remain smooth. A camel hide needed to be taken down intermittently and pulled with blunt metal scrapers on the flesh side of the hide or a wooden scraper on the grain (hair) side. Be careful not to make knife marks on the grain side of the hide, as this lowers the value of the finished product. The pulling and stretching of camel and cow hides is best done on a flat clean surface (table or bench) to press out water and to stretch fibres. Alternatively, the hide/skin can be strung up on a wooden frame and worked over repeatedly with scrapers to prevent the fibres from contracting while drying and to break the hard fibres so that the leather becomes soft and pliable. Be prepared for quite a bit of work during this stage - the more stretching, the softer the leather and the better the final price. The disadvantage of the alum method is that the resulting produce cannot be cleaned with water since the alum molecules remain water-soluble. Therefore, items must be dry cleaned, which is not convenient in most rural areas. No fixation process seems to be available, but treatment with castor oil solution or any of the fat liquor recipes listed below will help preserve the tanning and repel water. As an alternative method, vegetable tanning with commercially available wattle bark extract (mimosa powder) was tested on two camel hides and ten goat/sheepskins. This tanning extract is available in Kenya from East African Tanning, Thika. On the first day, 5% of the mimosa powder (based on weight of hides / skins - our 20 kg hide would require 1 kg mimosa powder) was dissolved in enough water to completely cover the hides/skins. As described for alum tanning, frequent stirring, preferably hourly was necessary so that the tanning solution would completely penetrate the hides / skins. On the second and on the third day another 5% mimosa powder (same amount as on day one) was added to the solution and stirring continued on regular basis for the next 3-4 days. A small cut can be made in the thickest part (on the neck side) of the hide/skin to see if the tanning solution has penetrated. Mimosa tanning gives a reddish-brown tinge, and the distinction between tanned and un-tanned leather is quite clear. After removal from the tanning solution, the hides/skins were washed thoroughly in clean water, then pressed/scraped with blunt scrapers to remove as much water as possible. A brain and smoke tanning recipe used by native Americans described by Dinsmore and Dinsmore (1996) was also tested on a small goatskin. It is often said that each animal has enough brains available to tan its hide, but Dinsmore and Dinsmore (1996) mention that lighter solutions could work as well. However, when trying this method in Ngurunit, the small skin used, although very soft in the tanning solution, dried out much faster than could be comfortably handled, and so the final product did not turn out well. If this method is preferred by pastoralists, more work is needed to adapt the recipe to the northern Kenyan hot and dry conditions. There was a considerable interest in the method, as some of the women mentioned they had seen their mothers or grandmothers use a similar method, but knowledge on details had now been lost. Hoyle (1994) provides a list of tannin containing trees, of which Acacia nilotica is mentioned to contain 40 % tannin in its pods. As this tree grows in Northern Kenya, the pods were collected and some experiments on its suitability as a locally available tanning material were done. At first the crushed pods were simply soaked to see what sort of solution was produced. The water soaked up the tannin materials from the pods and became red in colour, very similar to the commercial wattle bark (mimosa) solution. Experiments were carried out on goatskins with very good results. Literature describing oak bark extraction for tanning purposes (US Department of Agriculture 1962) was used as a guide for developing a method of extracting the tanning material from the pods. First, 5 kg of Acacia nilotica pods in a bag were crushed by hitting the bag with a mallet. The crushed pods were then mixed with 20 litres of fresh water and left to soak for six days with frequent stirring (four to six times a day). In the meantime, a goatskin and a neckpiece of a camel hide were prepared for tanning by de-hairing, de-fleshing and de-liming as described above. When ready for tanning, half of the pod solution (ten litres) was strained into another bucket to remove the pod pieces and then the skin and hide piece were soaked in the extract. The bucket with the crushed pod solution was refilled to the top with water and regular stirring continued. After three days this solution was strained of the crushed pods and added gradually to the soaking skin and hide piece. At the same time, three additional kg of the Acacia nilotica pods were crushed and added to 10 litres of water in order to produce more extraction solution to substitute for the first batch when its efficiency was decreasing. This method continued for three weeks during which every four or five days the soaked pods were strained out. to get the water for adding to the soaking hide/skins and more pods (about 1 kg each time after the initial starting amounts) being crushed and put into clean water (about 5 litres). The skin/hide piece was left in the solution until the red colour had penetrated the skin as evidenced by cutting a small cross section on the thickest part of the skin. Although the Acacia method is slow, the leather produced from this method had a very attractive tannish brown hue which seemed to be preferred by customers over the reddish brown mimosa tanned leather. The experiments carried out using an extract of Acacia nilotica pods to tan goatskins and a neckpiece from a camel hide showed results of similar, and sometimes superior quality to the mimosa tanned skins/hides. There is great potential and advantage of using Acacia nilotica pods over mimosa for two reasons. One is that the pods are locally available, abundant and a renewable resource in the Northern Kenya area. Secondly, mimosa powder that was purchased in large quantities at the beginning of the project appeared to be loosing its tanning qualities, probably due to the heat. The result is that the mimosa tanned products later had a stronger and somewhat unpleasant smell than before and the mimosa solution did not appear to be effectively penetrating the hides/skins like it did when the powder was fresh. The result of tanning with Acacia nilotica pods was a pliable, good coloured tanned skin and hide piece. The women therefore tanned a full batch of 10 skins after only one day of the pods soaking. However, this amount of skins seemed to slow down the process greatly and made the penetration of the brown tanning colour into the centre of the skins less effective. Presumably the short soaking period of the pods did not allow the tannins in the pods to be effectively released into the water. We concluded that for this tanning method it is essential that the extraction solution of the pods is prepared at least four to six days before submerging the skins in it. Soda ash measuring an equal amount to 5% of the original weight of the untanned hides / skins was dissolved in a water bath and the damp hides / skins added. While frequently stirring over the next fifteen to twenty minutes the tanning chemical was thus fixated in the leather. After this they were again washed in clean water. When bleaching and dying was desired it is usually easiest to do it immediately after the fixation process. To bleach the leather 1% Sodium metabisulphite (in these recipes all % was on basis of original weight of hide/ skins) was dissolved in a warm water bath, the hides / skins submerged and stirred for at least thirty minutes. This gave a slightly lighter colour of the final leather, and a clearer colour of potentially desired dyes. Commonly used and available leather dyes were dissolved in warm water and the hides / skins submerged for one to two hours according to instructions. A vinegar solution (1 L vinegar in 10 L water) was used for fixing the dyes. The women preferred natural colours, but one could equally dye this leather in any desired colour. To prepare this solution, the soap was shredded with a knife and all ingredients heated up in a pot to form a uniform emulsion. This emulsion was cooled down until lukewarm and spread onto the slightly damp hide / skin. Best results were achieved when this process was performed on a table covered with a plastic sheet. The grain side was covered first, then the hide/skin was turned over and the fibre (flesh) side covered with generous amounts of the emulsion (until the hide / skin was fully covered in Vaseline-coloured smudge). This emulsion need to soak in over night with the fibre side facing up to maximise penetration. Covering with a second plastic sheet over night help improve absorption of the emulsion and prevent the hide / skin from getting dirty in dusty environments. 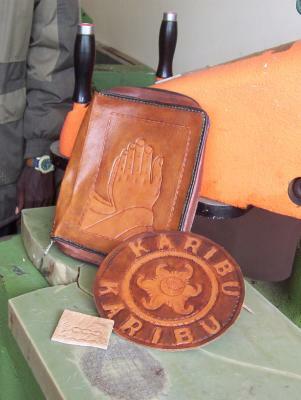 KIRDI (the Kenya Industrial Research and Development Institute) has developed a product from castor oil, which they recommend as superior to the above-described emulsion for oiling leather. However, this has yet to be tested properly under village conditions. But the castor plant grows wild in the environment, and could produce locally available oil, if tests are successful. The following morning, excess emulsion is scraped off the hide/skin before a final drying process while scraping / stretching with a slicker as described before. When almost dry, the hides / skins are worked over a rounded metal (an old metal hoe was used, but more appropriate tools can be manufactured) to ensure a smooth, soft leather surface. It is very important to start working the hide / skin when it is still damp and continue doing so until it is completely dry. Otherwise, a tanned hide / skin can become hard and stiff if it is not worked enough at this stage of the process. If this happens, the skin / hide can be re-dampened and worked again until dry and soft. This problem was encountered on one occasion when some oiled skins were left to dry too long before working, resulting a stiffer product than desired. To obtain an even smoother surface the dry leather can be sanded on the flesh side. Pumice stones are quite efficient for sanding. Additional polishing on the grain side with a clean smooth glass bottle or a hot iron will give the leather a shiny appearance. Adongo, A.O., Bruntse, A., Younan, M. and Recke, H. 2004a (in preparation). Livestock product processing for enhanced food security and sustainable income generation in pastoral areas of northern Kenya: Case studies from Marsabit and Moyale districts: First paper - milk processing. Government of Kenya (GoK). 2003. Ministry of Livestock and Fisheries Development. District livestock production annual report Marsabit district, Marsabit, Kenya. Government of Kenya (GoK). 2004. Ministry of Livestock and Fisheries Development. Hides and skins annual report for Marsabit district, Marsabit, Kenya. Hardwick, Gil (1996). An easy guide to making leather at home / Gil Hardwick, G. Hardwick, Margaret River, W.A. Hoyle, D. 1994. Small-scale rural leather tanning manual. VSO working paper. US Department of Agriculture. 1962. Farmer's Bulletin No. 1334. Home Tanning of Leather and Small Fur Skins. Extension Services. Box 1109, Juneau, Alaska.